Andreas Hadjipetrou is the Managing Director of Columbia Shipmanagement Ltd, with 20 years of experience within the organization. He has held various positions within the Cyprus office, as well as spending 7 years in Columbia's Hamburg office as Finance Director. 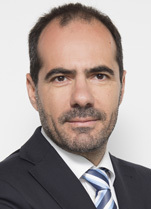 Mr. Hadjipetrou has recently been appointed the Group Director of Commercial and Business Development as a member of Columbia's Management Board. He also sits on the Board of Directors of Tsakos Columbia Shipmanagement (TCM), Athens, Cyprus Shipping Chamber (CSC);, Cyprus Maritime Academy, Cyprus Marine Environment Protection Association (CYMEPA) and Asia Marine Philippines. Mr. Hadjipetrou holds a BSc in Economics from the University College London and a Master of Business Administration in Total Quality Management from the University of Leicester.